Private Lessons: Private lessons are available Monday thru Saturday. All students are taught how to tack up their horse. Picking, brushing, and tacking your horse is a wonderful way to spend more time with the horses. You get to know them, their personality, and you learn to trust them, and they you. Once the student is comfortable taking this on themselves, they are welcome to come into the arena 10-15 minutes early to warm up the horse, and another 10-15 after to cool down the horse. 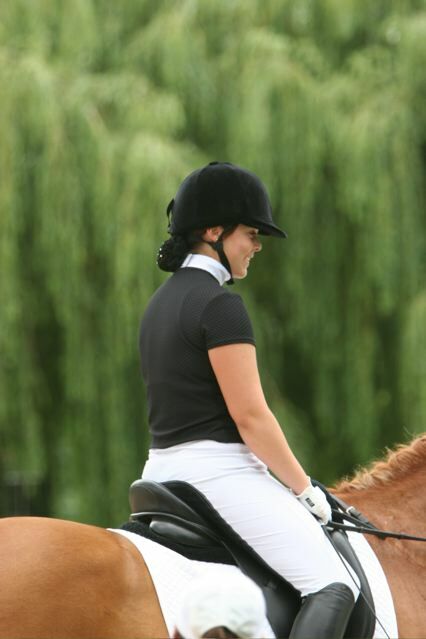 Training & Horse Shows: Training is a very important part of owning a horse. Not only to continually learn and advance you and your horse thru the levels of dressage, but to keep your horse respectful and safe. Our lessons and techniques adjust easily to a beginner child or adult or to the more advanced levels. Horse show training and guidance is also offered. Whether it’s your first “schooling” show or a weekend at a USDF event, we can assist in your planning of classes, trailering, and schooling at the horse show. It’s always a fun and exciting time to work together and support each other. Even those who may not be showing yet are encouraged to attend to show your support and see what the excitement is all about! Group Rides: Group rides are primarily offered to boarders. This is a time to come and have fun with friends and our horses. We offer a kid’s group ride once a week and an adult group ride once a week. Often an obstacle course is set up, or at times a “musical freestyle” has been a project in the past few years to show-off our new skills at our holiday party! Summer Camp: Summer camp made its debut! A novice and advanced horsemanship agenda were planned. Much fun was had for the week while getting to know tack, horses, painting a horse, bathing a horse, horse crafts, riding lessons each day, and ended with a pizza party, sleepover and continental breakfast! Advanced camp worked on putting their horsemanship to music. Just for fun, dressage, western riding, whatever your passion, everybody is welcome to join us at Harmony Hills Equestrian Center!